How to vote on Multiple Choice, Image choice, Quiz and 'Who will win?' questions. Multiple Choice, Image choice, Quiz and Who will win? questions are all based on the same principle: the audience picks an option from a list and submits the response. That's basically as easy as it gets! With the Image Choice question, there are miniatures of the images next to the options in the audience's phones. Clicking on those increases the size. 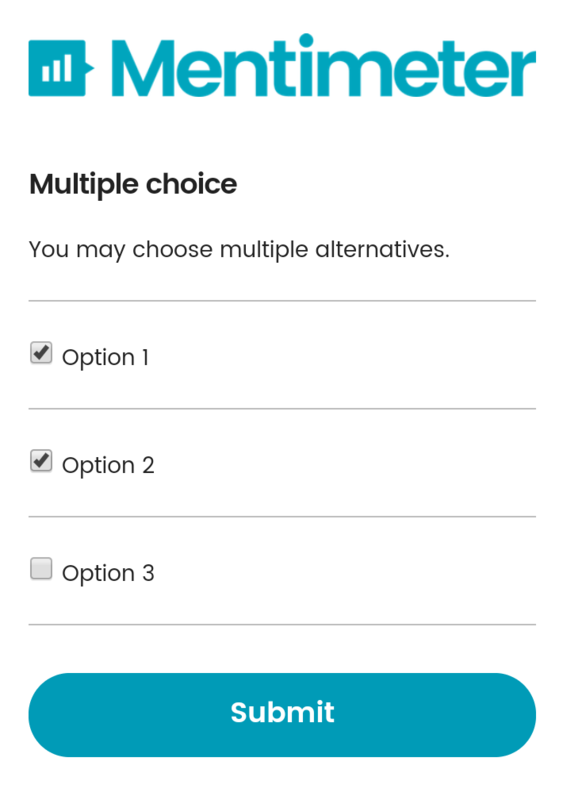 If you allow the audience to vote on more than one option, this is how it's represented in the phone: checkboxes to indicate that the participant can select multiple options. This feature is not supported by Quiz or 'Who will win?' question types. If you have several quiz questions in your presentation, the results from all questions will be accumulated to determine the final winner!